This has been designed to be very light weight under 800 Grams and low cost with replaceable blades, ideal for any new starter. This is two single handed Sabers or can be combined to make a very solid single Saber Staff. · Blade Tip Clear slightly frosted pitted tip glued in place. · Blade Base Clear base cap glued in place. · Blade Length 32 Inches long. · Removable Blade Untighten locking nut in rear of handle (Dont over tighten). · Removable Blade Interchangeable with other ForceSaber blades. · Hilt Length individually About 9 Inches long. · Hilt Length combined About 16 - 18 Inches long. · Hilt Center joint 3 Inches long. (always line up holes correctly first). · Hilt Width Main body 32mm wide, Smooth shell with 28mm center grip. · Blade Button Independent blade button. When turned on the button will lock in a low profile position. 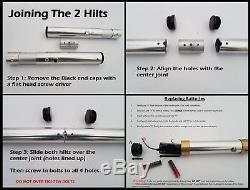 · Power Saber runs on 4 x AAA batteries in the base of the handle. · Battery Life over 4 hours of use. All our ForceSabers are bespoke custom handmade to order. They are all hand cut and sanded to ensure smooth safe edges, As the ForceSaber is 100% custom handmade there are normally slight cosmetic scratches or imperfections on the handle or blade, on occasion the raw materials may also come with imperfections or marks but this is only noticeable upon extreme close-up, when being used it will have no effect on the look or use of the item. This model does not have any sound installed on it. Every ForceSaber uses a pre coloured bespoke High Powered LED. This LED powers the blade and gives the blade the required colour needed, these looks amazing in low light (dusk) but in direct sunlight or bright day light it will not be 100% visible. We use a single powerful LED which has a high light output and has very low power consumption. All ForceSabers operate with a Standard Battery Setup. Standard Setup is a setup that uses regular AAA batteries to power your ForceSaber. (4 x AAA batteries are not supplied). You can user regular Alkaline batteries or rechargeable NiMh batteries. Every ForceSaber has a mid-grade blade so there extremely stronger but we advise against extreme combat or duelling. Do not leave blade exposed to direct sunlight for prolonged periods of time as this will alter the translucent glue in the blade tip. When replacing blade DO NOT overtighten the Micro Screw. If over tightened, this could lead to damage of the thread. Please note:- When purchasing this listing you are confirming you have read and seen all the information provided. The item "NEW STAR WARS FX LIGHTSABER, Skywalker, Vader. Model Apprentice Staff no sound" is in sale since Tuesday, February 28, 2017. This item is in the category "Collectables\Science Fiction Collectables\Star Wars Collectables\Other Star Wars".sabers" and is located in Wakefield. This item can be shipped to United Kingdom, Austria, Belgium, Bulgaria, Croatia, Cyprus, Czech republic, Denmark, Estonia, Finland, France, Germany, Greece, Hungary, Ireland, Italy, Latvia, Lithuania, Luxembourg, Malta, Netherlands, Poland, Portugal, Romania, Slovakia, Slovenia, Sweden, Australia, Canada, Brazil, Japan, New Zealand, China, Israel, Hong Kong, Norway, Indonesia, Malaysia, Mexico, Singapore, South Korea, Switzerland, Taiwan, Thailand, Chile. UPGRADED ELEGANT METAL SWITCH: NEW Low Profile Metal Switches Fixed In Place. UPGRADE EASY TO REPLACE BLADES: Undo Micro Screw At Rear. UPGRADED BATTERY LIFE: 4+ Hrs Battery Life Depending On How Used. Blade Has Translucent Qualitys: Tip Is A Clear Frosted Pitted Dome Glued In Place.